My sister requests brisket every year for her birthday, and this particular recipe is her new favorite. I use the flat cut of brisket as it cooks more evenly. Roast the brisket the day before you plan to serve it for the best flavor and texture. The leftovers are very good in sandwiches. The recipe is a combination of one my Aunt Mildred made and another from my friend Helen. I make two briskets, roasted in separate pans, if I am serving 10-12 people. The day before serving, preheat oven to 350 degrees. Place 3 tablespoons olive oil in the bottom of a roasting pan. Place 2 sliced onions in the pan. Season onions with a bit of salt. Lay the brisket fat side down in the pan. Season the brisket liberally with salt, pepper, garlic powder, onion powder, thyme, and marjoram. Drizzle a little olive oil on it. Turn the brisket to fat side up. Season the fatty side with salt, pepper, garlic powder, and onion powder. Sprinkle it with the dry onion soup packet. 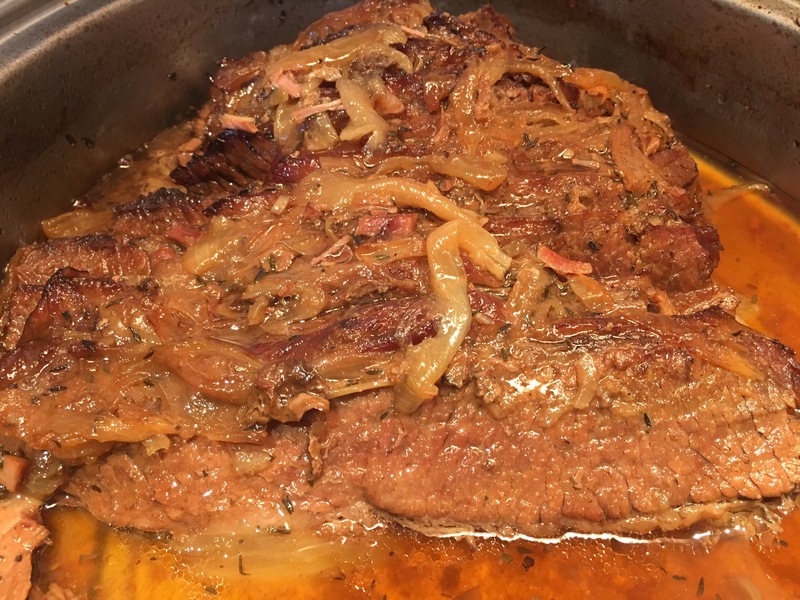 Place the remaining sliced onion over the brisket to cook it fat side up. Drizzle with a little olive oil. Cover the pan tightly with foil or a lid. Roast for 3 hours. Remove brisket from the pan and, while hot, slice it into 1/4-inch thick slices against the grain. Return the sliced meat to the roasting pan fat side up and cover the pan. Cook 2-1/2 to 3 more hours until the meat is fork tender. You will have plenty of juices in the bottom of the pan. Chill covered overnight in the same pan. About an hour before serving return pan to oven and reheat, covered, at 350 degrees until hot. Serve with pan juices drizzled over the top. Serves 8. This entry was posted in Beef, Christmas, Easter, Meat Dishes, Thanksgiving. Bookmark the permalink.